The first thing you see after you unlock your Droid X is the Home screen. The Home screen is also where your Droid takes you whenever you end a call or quit an application. To return to the Home screen at any time, press the Home soft button. Status bar: The top of the Home screen is a thin, informative strip called the status bar. It contains notification icons and status icons, plus the current time. No matter which part of the Home screen you’re viewing, the top part of the touchscreen stays the same. Notification icons: These icons come and go, depending on what happens in your digital life. For example, a new icon appears whenever you receive a new email message or have a pending appointment. Status icons: These icons represent the phone’s current condition, such as the type of network it’s connected to, its signal strength, and its battery status, as well as whether the speaker has been muted or a Wi-Fi network is connected. Widgets: A widget is a teensy program that can display information, let you control the phone, access features, or do something purely amusing. 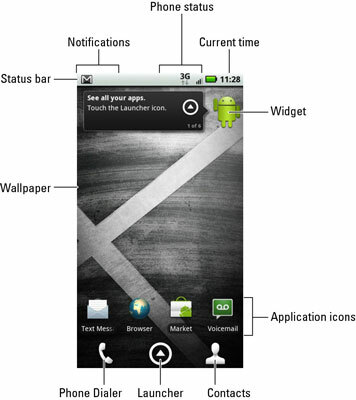 Application icons: The meat of the meal on the Home screen plate is the collection of application icons. Touching an icon runs the program. Launcher: Touching the Launcher button icon displays the Applications Tray, a scrolling list of all applications installed on your phone. And now, the secret: The Home screen is seven times wider than what you see on the front of your Droid X. It has left and right wings to the Home screen. To view the left and right sides of the Home screen, swipe your finger left or right across the touchscreen display. The Home screen slides over one page in each direction every time you swipe. The wider Home screen gives you more opportunities to place applications and widgets.